Colour is the inspiration behind Artitja Fine Art’s mid year Indigenous art exhibition entitled DESERT COLOURS - featuring the best from the central desert communities of Utopia and Yuendumu, a new Adelaide based art centre nurturing desert artists and closer to the coast, Roebourne in WA. With Australia’s ‘red centre’ currently renamed the ‘green centre’ due to several bouts of torrential rain sweeping through the region earlier this year resulting in the flooding of inland rivers, an abundance of flora and fauna are gracing this desert wonderland. “In ten years of my visits to the desert, this is the first time that within minutes of driving out of the airport a huge mass of green budgerigars flew over the car. It was very special” says Director of Artitja Fine Art Anna Kanaris, “even locals have not seen such a sight in many years. That rain will guarantee that wildflowers will be in abundance this spring and there will be plenty of bushtucker too”. That also means an abundance of colour which is quite often an inspiration for the Indigenous artists choice of palette. Contrary to widely held belief, desert artists have always used bright colours to represent their dreamings and their country. 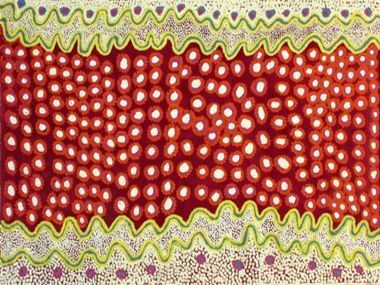 Albert Namatjira is famous for his representation of the purple haze on Mt Sonder, and some of the more abstract artists from Yuendumu Paddy Sims and Paddy Stewart for instance were using blues and pinks in the 1980’s, as were early Utopia artists, most famously Emily Kngwarreye. The legacy of these artists continues to inspire not just existing artists, but also the collectors who are constantly surprised and enchanted with the quality and complexity of what is a strong and still growing art movement. “I’m particularly excited about two aspects of this exhibition”, says Kanaris. “Firstly because of the vibrancy of the works coming out of the newly established Ngura Wiru Winkiku Cultural Centre (run through the Better World Arts project in Adelaide) in which artists from Fregon and Ernabella who for one reason or another need to live in the city are painting, and secondly because after several years of waiting I have finally sourced the most exquisite carved wooden sculptures from well known Utopia carver Wally Pwerle”. From the Cultural Centre we feature Pitjantjatjara elder and established artist Rama Kaltu-Kaltu Sampson, from a nomadic family who settled in Ernabella as a child. Rama depicts his Rainbow Serpent Dreaming using a courageous blend of deep crimsons, yellow, green and a touch of blue to create a mesmerizing canopy of colour and meaning. 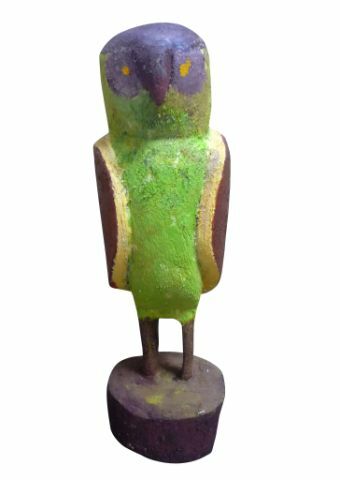 Reputable carver Wally Pwerle from the Utopia region has been recognised for his sculptures for over fifteen years during which time his ceremonial figures have been acquired into public institutions and key private collections. The exhibition will also feature a select range of sculptural and functional beanies from the celebrated Beanie Festival held annually in Alice Springs and designed by jeweler and textile artist Siri Omberg who works very closely with women in central Australian indigenous communities. 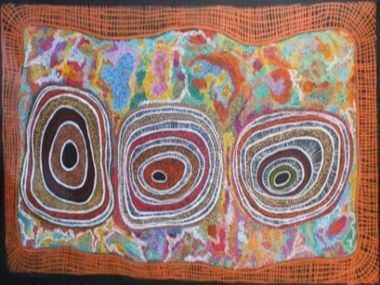 Artitja Fine Art specialises in art from Utopia and the western and central desert regions. Directors Anna Kanaris and Arthur Clarke operate a home based gallery in South Fremantle, open by appointment daily. They also hold up to four exhibitions a year in a gallery space, ensuring that a wider Perth audience can easily access the work, and learn about the culture and art of Australia’s Indigenous people. DESERT COLOURS is free to the public. Opens 6.30pm Friday 16TH July 2010 and continues 11am to 5pm daily until August 1st at 330 South Terrace, South Fremantle.